It’s not often I can claim such an amazing view while I work. But today as I sit less than 100 meters from the crystal turquoise waters of the Caribbean Sea in Cancun, I’m reminded just how lucky I really am. It’s been nearly seven days since we landed in Cancun to explore and familiarize ourselves more with the area and products including other all-inclusive resorts and scuba diving options. Our total stay stretched from May 23 to June 2, 2015. Club Med Cancun Yucatan has been home base for this ten day trip. There are pluses and minuses to every property and here are a few of our personal observations. Our observations aren’t necessarily indicative of every person’s experience, but it does help you understand why we ask the questions we do when finding the perfect vacation spot for you! Club Med Cancun Yucatan, as with other Club Med locations, is considered to be one of the first – if not the first resort – in the area. Hence it’s sublime property location and space. SPACE! The beach on property stretches anywhere from 4- 5 times what any other property can offer. Some of the beach is more private like by the snorkeling area and the five-Trident Jade area has its own beach space as well as a pool. For our clients interested in a more accessible property, this is not likely the best fit. There are many steps and stairs around the entire property and in the rooms. Our room alone has four steps to get to the patio, then another two to get up to the living area. There’re a flight of stairs into the main restaurant, The Hacienda, and large step-ups even within the buffet to get your food. Speaking of food… it’s been overall okay. Plenty of fresh vegetables and fruits, pastries, and general selection of items to choose from. Baby formula is available at every meal as well as a variety of milks for those following different diets (no coconut milk that I saw though). We do highly appreciate the listing of ingredients in everything served so if you do have an allergy or food preference, you can still follow that if you choose. Ingredient listing also tends to allow you to try different foods that maybe you didn’t think you would try originally. At least this was the case for me. The two specialty restaurants on-site (which require reservations) are La Estancia (an Argentine steakhouse) and Las Cazuelas (regional Mexican specialties). La Estancia was a let down for us as the ribeyes we ordered were not cooked correctly and had a gray appearance and mushy texture. Las Cazuelas for late lunch hasn’t disappointed. It’s a more limited selection than the grand buffet at La Hacienda, but the foods have been more regional and definitely very good. La Hacienda presents a different theme for the buffet each night and it ranges from seafood to Italian and, of course, Mexican fiesta. Some nights we especially loved the selections and other nights not so much. But we didn’t go hungry! Club Med requires wrist bands for its guests which is kind of a bummer, but it isn’t so bad after you get used to it. Alcohol on the bars isn’t all brand name like most Americans would recognize. There are a few though and they differ at each bar. If you’re not an alcohol snob, it won’t matter. I had a good time with my vodka-Sprite and muddled limes and it didn’t matter that it wasn’t Grey Goose or no name. Marta at the pool bar was a hoot and made a mean drink! We stayed in the Turquesa building in a deluxe oceanfront or oceanview room. We were a short walking distance to the main bar, theatre, La Hacienda, pool and beach; we walked or used the golf carts to get to the tennis courts, Las Cazuelas, and snorkeling though. The close proximity was great except for the few night performances when you could hear the music a bit. Not a make or break, but if you turn in early for sleep or sleep lightly, this may not be the building for you. Our room was comfortable and I’d give it an overall rating of 3 stars. There’s some wear and tear on the furnishings, the bed is rather low in height and firm, and it doesn’t have extensive decorative details. Two closets with shelving allow plenty of storage space for your belongings as well as the in-room safe. The colors were bright pinks, oranges and purples and architecture around the property recalls the Mexican details of its location, but with the creature comforts you need. The bathroom’s spacious shower with wand and rainshower head were very nice. The toilet is in a separate closet with no fan. I appreciated having the cotton bathrobe and slippers to pal around in; hubby just doesn’t understand! 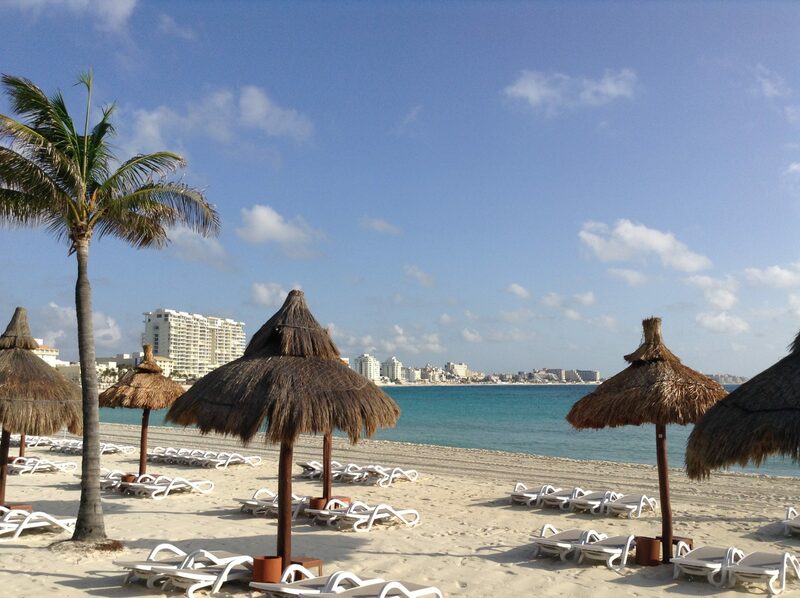 While at Cancun Yucatan we played tennis, snorkeled, relaxed on the beach, did some diving, and socialized in the bar. Our active days prevented us from staying up to watch the stage shows with GOs unfortunately. When we first arrived we visited with the on-site scuba shop to get a feel for where they went and pricing. Yes, it’s convenient to book on-site, however you will pay dearly for this convenience. If it was a nominal price, we would have let it slide. However it was nearly double what we ultimately paid with another local shop even with our transportation factored in. Contact us to plan your next Dream Vacation. Go There With Us.